I really feel like I need to write about what happened this past week. This experience, as horrible and heartrending as it was, has changed my life in many ways. A week ago Monday I was hiking on the Salmon River. I was standing on the bank of the river with Raf and we were listening to the sound of the water rushing by. We remarked to each other about how good the salmon fishing must be here and we stood there, taking in the beauty and serenity of the place. I thought to myself, “I can’t wait to get Doug up here so we can take him fishing.” I thought that it was just what he needed to help him on his road to recovery. My mom and him were planning on buying a travel trailer so that they could come here and stay for awhile when they wanted to get away from Spokane and I was really looking forward to having them here. It was that evening when my mom called to tell me that Doug didn’t have much longer to live. I didn’t know what to say or think. I kept hearing about how he was going to be released from the hospital and he would be home soon. How did it come to this? I asked my mom if I should come home but I already knew I would. I felt compelled to go. There wasn’t any question I needed to go and I needed to get there right now. I thought about waiting until Sunday (since I have Sundays and Mondays off) but that thought didn’t stick very long. I just needed to get home to see him. We drove over Thanksgiving morning and it was a difficult drive. A part of me knew that it would be the last time I saw him alive and it was breaking me up inside. I cried almost the whole drive. I was afraid of what I was going to see. I was afraid of seeing him laid up in a Hospice bed. On the way there I called my mom and asked her how things were and she said that he wasn’t eating and that concerned me. I felt so helpless. We got there, finally, and I saw him laying there. He was awake and I asked him how he was doing. He said, “I’m just glad to be home.” He hated staying in the hospital and he was glad to be home with his family. He didn’t look good. He was in bed and he couldn’t talk very loudly. But he was coherent and he could talk to us and be a part of our conversations. He asked for some of his favorite Thanksgiving foods, one of them being Pea Salad, his mother’s signature Thanksgiving dish. He would eat a bite but that would be all. He wasn’t drinking much fluid either. I was really concerned about this. I encouraged him to eat and drink so he could “get his strength up.” I was still hopeful that he would recover. Well, hopeful or in complete denial. The rest of that day and evening he talked to us as much as he could and even told a story or two. We spent the night at our house (that we trying to sell) and we came back to mom’s house early the next morning. He was pretty much in the same state. Still asking for a bit of food here and there. Still talking to us. My mom said that the night before he asked her, “Could you get me the phone, I need to call my mom to tell her I’m coming home.” That kind of gave us all shudders. The Hospice nurse came and basically laid out the reality of the situation. They were surprised that he survived Thanksgiving and were happy to see that he was still talking. But she explained to me that eating is “not helpful to him right now because his body can’t handle the digestion process.” That kind of made it all real to me. My mom was asking her about care and trying to figure out in her head if she had enough money for a nurse to come a couple of times a week to take care of him. She figured that she had enough for 3 months. The nurses looked at each other and one of them said, “honestly, that won’t be an issue.” This is when we all just realized the situation. He really was dying. And he could be gone very, very soon. My mom called his two best friends to tell them that if they wanted to visit they needed to come that day. The were planning on coming Saturday but it looked like Saturday would be too late. They came and we all had a great visit. His best friend stayed for about 4 hours and we heard the other side of Doug’s crazy stories. It was fun. He even laughed a few times. Later on in the evening he started coughing and I asked my mom if there was something we could give him to alleviate the congestion. I seriously had no idea what was going on. I thought we could just give him a pill and he would be alright. 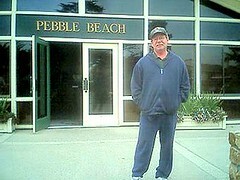 At one point he said, “Hey if you go by there again could you get me another hat?” So I asked if he was talking about when we visited Pebble Beach. It made me feel good that he was thinking about that. They came to visit me in Santa Cruz the weekend of my graduation from library school and I made sure to take him to Pebble Beach because he was a avid golfer. I even bought him a baseball cap as a memento of the day, which he wore all the time (and is wearing in the photo in the previous post). Raf suggested that we spend the night at my mom’s house so we could stay up with him and she could get some sleep. I fell asleep at around 10:00 and woke up again at 2:00 am. I was so tempted to sleep through the night but I forced myself awake and I told my mom that she could go to bed. By that time he was asleep and pretty unresponsive. He started the death rattle. At the time I didn’t know what this was. I thought he was drowning in the fluid accumulating in his lungs. It was horrible. Eventually I started crying because I knew the end was near. Again, I felt so helpless. I wanted to help him but I didn’t know what to do. All I could do was cry. Eventually I decided that I needed to talk to him so I sat next to him, took his hand and told him that I loved him very, very much. I told him that he had been a good step-dad and a good friend and that I was going to really, really miss him. Around 6:00 my mom got up and she rattled around the house, feeding the dogs and doing her morning routine. When Doug heard my mom’s voice and the dogs barking he smiled from ear to ear. I woke my brother up so he he could be with his dad. we spent the next few hours trying to figure out how to alleviate the “congested breathing.” We called Hospice several times and eventually they said they would send over a nurse. The nurse finally arrived and she began administering to him. She checked his heartbeat and was about to check something on his back when she stopped mid-sentence and said, “I don’t mean to be blunt but can you hear the way he is breathing? There periods where his breathing stops and then he takes a deep breath. This means he is actively dying. You need to come and tell him it is ok for him to go.” So my mom sat next to him and started talking to him. Then my brother did the same and so did I. He took a few more breaths, then they stopped. Then he would breathe again and then they would stop. Then he took one more breath. As he was doing this we were crying and telling him how much we love him and that his parents were waiting for him and he should go to them. My mom said to him, “Doug, I will be o.k.” And then that was the last breath he took. while all of this was happening my cell phone rang. I thought to myself, “who is calling me? I’ll have to deal with that later.” Then, just as Doug was literally breathing his last breath, my mom’s land line rang. I answered it and it was his best friend, the one that visited the day before. I couldn’t believe it. I told him what was going on and he said, “don’t say another word I’m on my way over.” He came over and he ended up taking care of us that morning while Doug’s body lay in the other room. The person who called my cell phone was my Dad. When I told him the situation he said, “I was concerned and I felt like I needed to call you.” It was really freaky. But it made me feel good too, that he could, somehow, know that I was in the worst pain of my entire life and was there to help me. hugs to you and your family. this is definitely one of the hardest things you can go through, but you are so lucky you got to spend a precious few moments with him and that he was talking. not everyone gets that last chance. I’m glad you were there in the end and got to tell him how much you loved him and got to say goodbye. My heart goes out to you and your family. .-= Dianne´s last blog ..What’s For Dinner? =-. I’m totally crying over your loss of your father. I’m so sad for you and your family, but happy that he is in a better place and can rest now. Love to you, Doug!! I’m so sorry for you and your family. You did a wonderful thing being with him and telling such a wonderful story about the man. I was with my dad when he took his last breath 25 years ago. I still have that memory. And I mostly remember the very good things. Beautifully written and absolutely heart wrenching. I know exactly how you felt and remember very well how it went when I lost people very near and dear to me. You brought tears to my eyes reading this as I relived my loss. Be there for your mom and family and let them be there for you. moni, what sweet great words you wrote here. hospice moves so quickly so suddenly – i don’t know how a person can know how to react, or what to expect. you just want to help the one you love. and terms like ‘actively dying’ are so so scary. you are definitely a strong and good person to be able to be there and help your family at such a time. ay. words aren’t enough. a big hug. I am so sorry! This has to be so hard. You’re in my thoughts. Moni – hey, just checkin in on you. Thanks for sharing your story, Doug sounds like a tremendous guy. I am so sorry for your and your Mom’s loss.